The class Basidiomycetes includes those members that produce their basidia and basidiospores on or in a basidiocarp. The morphology of the basidium is variable. Until recently the morphology of the basidium was believed to be a key to determining relationship in the Basidiomycota. Basidial morphology was once the basis for classifying the fungi to class or subclass. However, rDNA sequencing analyst (Swann and Taylor, 1993), septal pore morphology and cell wall biochemistry (McLaughlin et al, 1995) have determined that far too much emphasis was placed on this characteristic and all members of the Basidiomycota that produce basidiocarps are now included in a single class, the Basidiomycetes, and the morphology of the basidiocarp and basidium are characteristics that are now used to classifying fungi into the various orders of this class. This is the order of Basidiomycetes with which most of us are familiar. This is the order that is commonly referred to as mushrooms. 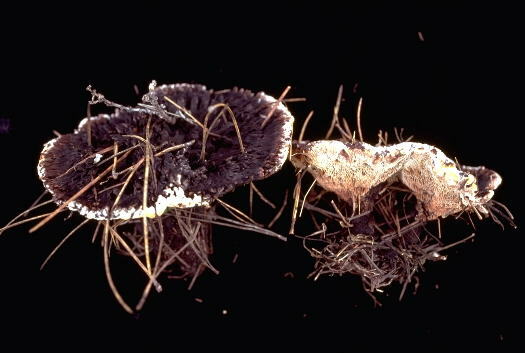 Basidiocarps of this order typically are "fleshy" and have a stipe (=stalk), pileus (=cap), and lamellae (=gills) where the basidia and basidiospores are borne (Fig. 1-4). 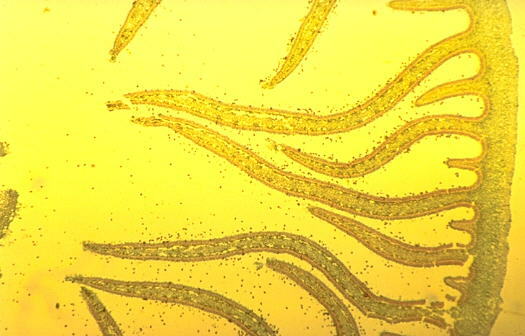 The Basidiospores in this order of fungi are forcibly ejected from the basidium, into the area between the lamellar edges, which then allows the spores to fall free from the mushroom and be dispersed by wind. A demonstration of this mechanism can be observed here. 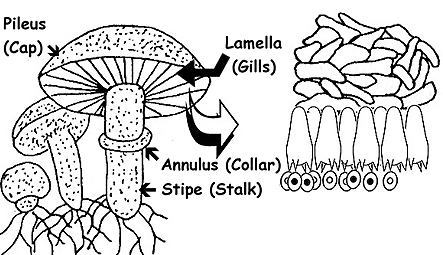 Figure 1: Typical mushroom of Agaricales: Stipe, annulus, lamella and pileus. Basidia and basidiospores are produced in an hymenium on the lamella surface. Figure 3: Higher magnification of section through the lamella of mushroom. Basidiospores now visible on the upper and lower edge of lamella. Figure 4: High magnification of basidia. Center basidium shows two basidiospores of four on sterigmata. The mushroom life cycle will be used as representative of the basidiomycete life cycle. Although clamp connections are present in the dikaryon of some species of, they are also absent in many. Clamp connections are believed to function in ensuring that each cell has a compatible pair of nuclei. The formation of a clamp connection is described here. Figure 5: Amanita marmorata ssp myrtacearum. Commonly associated with Eucalyptus, Melaleuca and Casuarina. 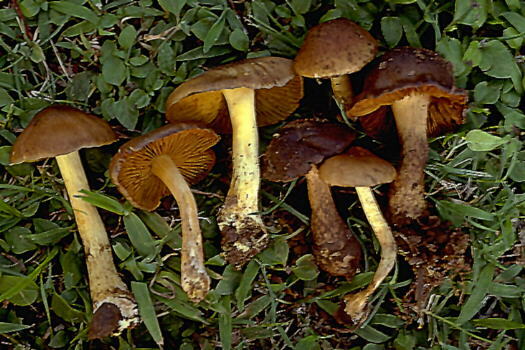 Figure 6: Cortinarius clelandii. Commonly associated with Eucalyptus, Melaleuca and Casuarina. 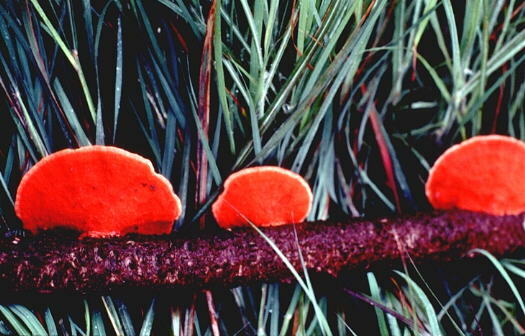 Figure 7: Laccaria fraterna. Commonly associated with Eucalyptus, Melaleuca and Casuarina. Figure 8: Suillus salmonicolor. Associated with species of Pinus. Note that this species produces a porous hymenium rather than gills. 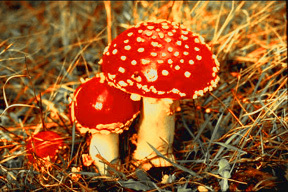 Figure 9: Amanita muscaria. Associated with species of Pinus. Species in this order are often coriaceous, leathery to woody, but may also be fleshy. 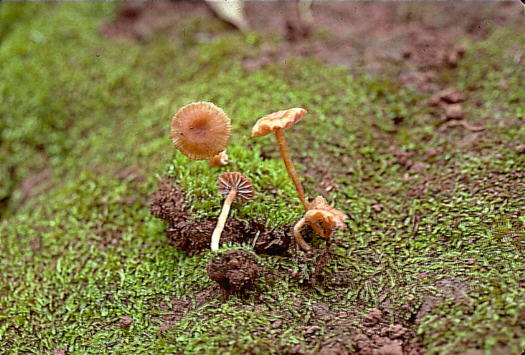 The basidiocarps and hymenia are more variable than in the Agaricales. Examples of members of this order can be observed below (Figs. 10-14). 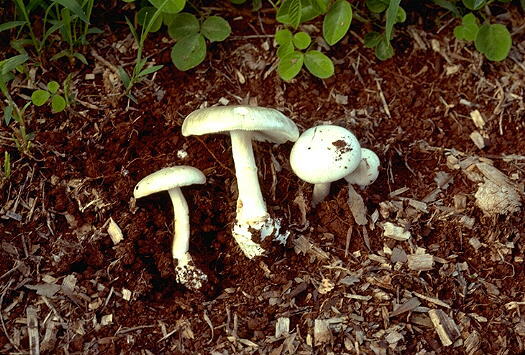 As in the case of the Agaricales, the basidiospores are forcibly ejected from the basidium and are then dispersed by wind. 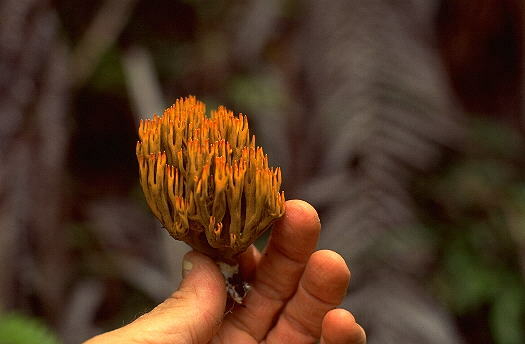 Figure 10: Ramaria fragilima, a coral fungus. 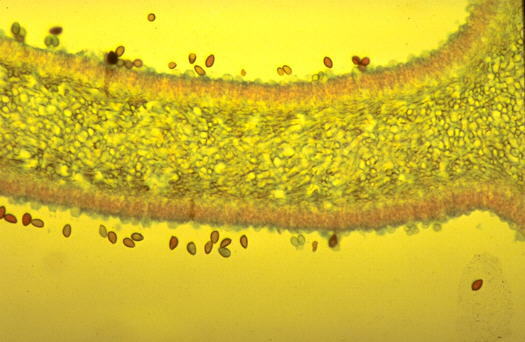 The basidia and basidiospores are formed at the tips of the basidiocarp. Figure 11: Pycnoporous sanguineus, a polypore. The basidia and basidiospores are formed in the pores of the hymenium surface on the basidiocarps (see Fig 12). 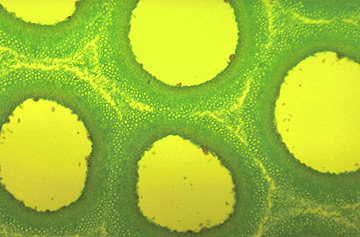 Figure 12: Porous hymenium from a prepared slide. 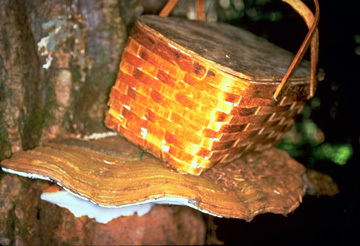 Figure 13: Ganoderma applanatum, another polypore. Figure 14: Hydnellum peckii. 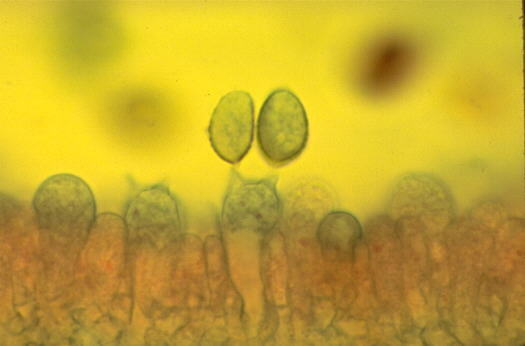 The basidia and basidiospores are formed on the spines of the hymenium surface of the basidiocarp.